I thought I would share some our strategies (I use that term loosely) that we used with E, and that we plan to use with the new baby. They seemed to work for us, and I'm hoping that they will be successful again. I am also trying to refresh my memory so I don't need to reinvent the wheel here! 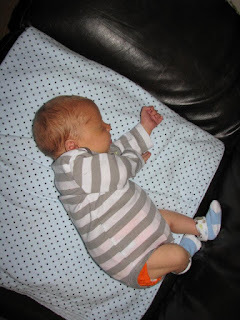 Diapers - we used cloth diapers exclusively for the first few months of E's life (except when travelling), and then we started using a disposable at night time. When he was about 18 to 20 months old, we switched to disposables full time because he was so mobile that the cloth ones didn't seem to fit him as well. We will be using cloth diapers again. I like them because I prefer to have the cloth against his skin than a disposable diaper. I know we can't avoid all chemicals and other things like that in our lives, but I do try to make the decision to avoid them when I can. I also just like the idea of having them delivered to our house and never having to worry about buying diapers on sale or running out. Breastfeeding - I am a big supporter of breast feeding and Dave and I both knew we wanted to succeed at this when we had E. It was hard but we kept going and eventually E and I were pros at meal times. I don't know what this baby will be like, but at least one of us knows what they are doing this time, so I hope it will be easier! E was exclusively breastfed until he was about 9 months old and then we moved to formula until he was 11 months when we switched to whole milk. Sleeping - I vaguely remember the "schedule" that we had for E when he was a baby. The first two months were sort of a blur, then it was Christmas time and we were away for a few weeks. In February (when he was about 3.5 months) I started going to the gym twice a week to work out with a trainer. We would get up in the morning, eat, play a bit, and then E would go down for a nap around 9:00. I would get him up at 11:00, feed him quickly, and then head to the gym. After the gym, he would eat again, and then we would drive home. It would be absolutely necessary that he not fall asleep on the drive home otherwise he would not have his afternoon nap. I would sometimes roll the windows down (dependent on the weather), play the music loud, and reach back to wobble his seat. If he fell asleep for even a minute, he would then refuse to nap in his crib when we got home. But when he waited until he got to his crib, then he would nap for about 2 hours. He would sometimes have a nap around 4:30 for about half an hour, it was like he could just not last to the end of the day without another nap. On the days when I wasn't at the gym, we would follow this rough schedule, and when we had plans out of the house, he would just nap in his car seat. 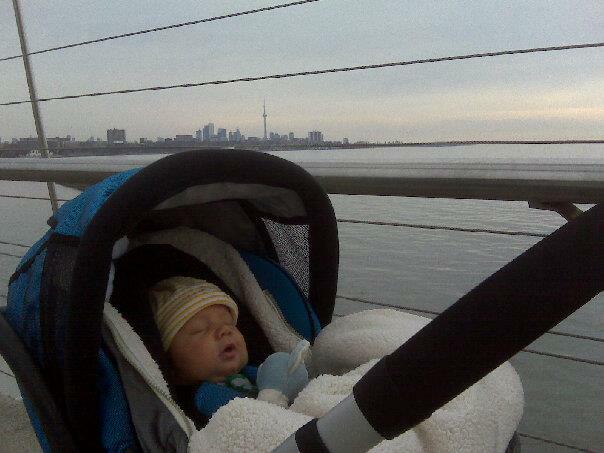 As long as he couldn't see anyone while he tried to fall asleep, he didn't have an issue sleeping outside of his crib. Our bedtime routine involved a bath every other night, feeding, and then stories. We read to E since he was really little. I never had to nurse him to sleep which was great, and after he was about 6 weeks old, we didn't hold him to go to sleep either. We would swaddle him up in a blanket (sleep sacks would give me the heebie-jeebies, and I didn't want to subject my child to the same thing, I wanted him to be able to escape the swaddle if he really wanted to), and put him down with his soother in the crib, and then leave. We would also put some music on in the background. 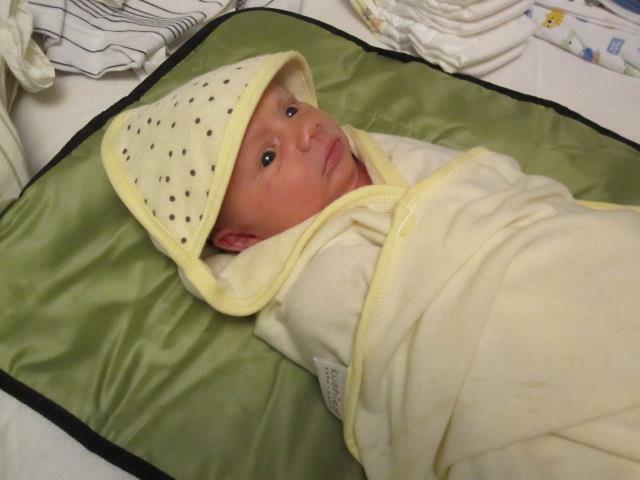 Then we would take turns going back upstairs when he would cry, and re-swaddle and/or find the soother. Sometimes it would take an hour for him to get to sleep and several trips back upstairs, but it is what worked for us, and the time and trips upstairs became less and less. I don't know if we will bother with the music this time, but we might. I don't know if it made a difference or not. Soothers - We liked the soother, it came in handy a lot. It was suggested that we didn't introduce a soother until he was about 1 month old so that he could get used to breastfeeding and we didn't want to confuse him. 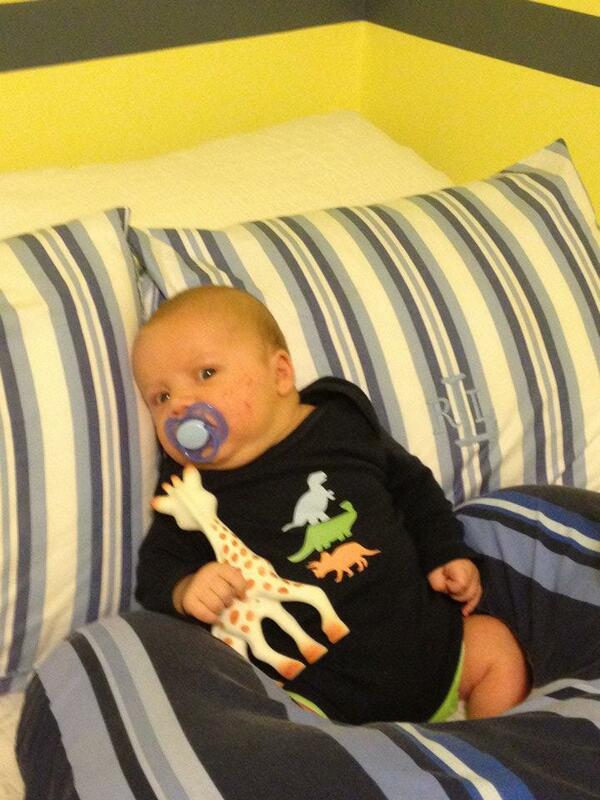 He took to the soother when we gave it to him and used it until he was in daycare. I can't remember the exact time that we took it away but I do remember that it was before he was 18 months old because he was still in the infant room at the daycare. For awhile he was just using it when napping and sleeping at night. It was rare that he had it outside of his crib. One day the staff at the daycare said they were going to stop giving the kids soothers at nap time, so we said, that's fine, and we just stopped giving it to him at night too. I don't remember it being a big deal which was great. I think the pooping, eating, sleeping and crying covers the first 6 months! We'll see how it all plays out with this new little guy! Yes, the diaper service is great! And breast feeding is the best! Such sweet pictures of Baby E!